“What the hell is this supposed to be showing?” you might ask. 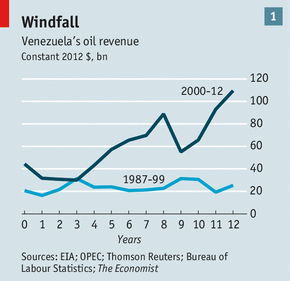 According to the article, “In real terms, between 2000 and 2012 Venezuela’s total oil revenues were more than two and a half times as great as those of the preceding 13 years—even though output declined after 2000 (see chart 1).” That is, the right end of the blue line immediately precedes the left end of the black line. And I guess the point is that the black line is higher? Those two lines both show oil revenues for the same country (Venezuela), but for different time periods, with the X axis giving the number of years since the beginning of a given period. Since Chavez took office at the beginning of 1999, they logically divided the graph at the beginning of 2000 instead. This graph manages to do a bad job of illustrating the basic thing it was going for – that oil revenues went up. It gets better: to see the point made in the actual text, you would need to eyeball the areas underneath those two curves. Luckily, they don’t happen to cross, but I’m not sure I’d guess that the area under the black curve is 2.5 times the area under the blue one. It looks more like double to me. If only someone had invented a way to illustrate the relative proportions of two totals. All I can think is that someone told the poor person responsible for making this graph that it needed to be (roughly) square. The Economist’s graphic design people, by revealed preference, clearly love square-shaped graphs. Next Next post: Do any individuals respond to disease risks?